Michael Schumacher is in a critical condition in a French hospital as a result of the head injury that he suffered in a skiing accident on Sunday. A statement issued by Centre Hospitalier Universitaire de Grenoble on Sunday evening confirmed that Schumacher's injuries were very serious and that he had undergone emergency surgery. It described Schumacher's condition as critical and said he was in a coma. 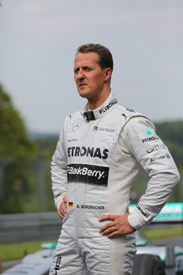 The statement added that Schumacher had suffered from a "head trauma with coma, which required immediate neurosurgical treatment." The seven-time Formula 1 world champion fell while skiing in the French Alps and hit his head on a rock. His injuries were sustained while skiing between two of the Meribel resort's toughest pistes. Medical personnel attended to the 44-year-old, who was wearing a helmet, within minutes and he was airlifted to the nearby Moutiers hospital less than 15 minutes after the accident. He was later transferred to the Grenoble hospital, which specialises in brain injuries.